Tara Picklo - Yoga Off Broadway | Yoga for Every Body! Tara truly tapped into a consistent yoga practice in 2009 when she was in the midst of challenging time caregiving for a loved one. She sensed something special about yoga after the first vinyasa class she took in Eagle at Yoga off Broadway (when it was in the little yellow house!). 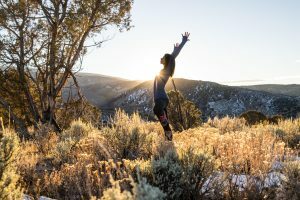 The connection of movement to breath, feeling the opening of energetic pathways in the body plus the overall strengthening and flexibility she felt became something she craved regularly to help create balance in life. Through the past decade her yoga practice has ebbed and flowed to compliment a busy schedule racing bikes and running a business while also helping her heal mentally from stress and anxiety, physically from injuries and emotionally from tragic grief. Tara completed a 200hr Teacher Training with Julia Clarke through Colorado School of Yoga and now teaches integrated vinyasa and yin yoga. She recently began a Yoga Therapy program through Inner Peace Yoga so she can continue to help others create a yoga practice that heals body, mind and soul. It has become a passion for Tara to share her love for yoga with communities of yogis, helping others feel harmony and openings in their own body and practice. Tara likes to create fun flows that balance the body through strategic anatomic and energetic sequencing and believes in feeling strong but soft both both on the mat and in life.